Green Olive Tours Blog • Palestine • Israel: Criminals! The Bedouin citizens of Israel have committed a terrible crime: They were born Bedouin in a Jewish state! How do I know this? Very simple, the State of Israel has established a police unit whose only task is to fight against its Bedouin citizens. It is called the "Yoav Unit" and it is a part of the Israel police. As of now 150 policemen serve in this unit and the goal is to reach a force of 400. They engage in home demolitions, crop destruction and the demolition of Bedouin villages. 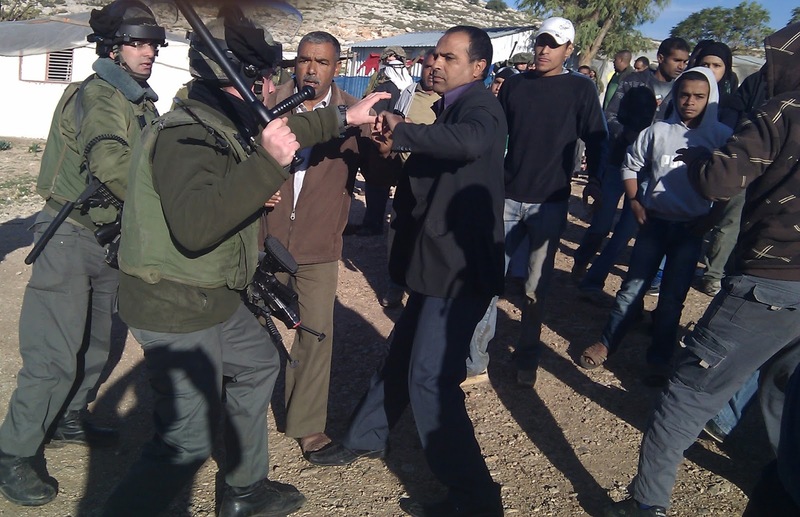 This war of the State of Israel against its Bedouin citizens did not begin in recent years. It goes back to the very establishment of the state. Like the rest of the Palestinians who lived in the country before 1948, most of the Bedouin were expelled-fled during the war. What is less well known is that after the end of the war the State of Israel continued its war against its Bedouin citizens. Bedouin continued to be expelled from the country for another 10 years after the cessation of the fighting. Alongside the expulsions, the state concentrated the remaining Bedouin in the Sayag area of the Negev (North-east of the Negev) while implementing a huge land grab. This is the way the problem of internal refugees was created, not in the heat of battle, but as a consequence of a unilateral war conducted by the Israeli government against the Bedouin citizens of the state. But even this was not enough. At the end of the 1960s the government began its policy of concentrating the Bedouin population in townships, once again creating internal refugees in its unilateral war against Bedouin citizens. And thus it is that as of today the state has succeeded in concentrating about half of the Bedouin in the Negev in separate townships that were established specifically for them. There remains one small problem, most of the Bedouin don't "understand" that the state only "wants their welfare" – so to help them understand, the state demolishes their homes, destroys their crops, limits their pasture area, and denies them running water, electricity and municipal services. If this doesn't help, it destroys entire villages. The point is to get them to give up their lands, villages and homes and to "agree" to move to the townships. These townships, of course, suffer discrimination in planning and budgets and soon become centers of poverty, unemployment and crime. Most of the time when I talk to Jewish citizens of Israel about the situation of the Bedouin citizens of Israel, I hear about Bedouin crime, illegal building and the takeover of state lands, and I am shocked again and again at how the state has succeeded in distorting the picture so that the robbed have become the robbers, the victims the criminals. And then I notice that there are no reports in the Hebrew media that in the year 2011 the Israeli government demolished more than 1000 Bedouin homes. There are no reports about the demolition of hundreds of homes a year. The media is silent when the State of Israel forces Bedouin citizens to demolish their own homes. And there is silence once again in the face of the destruction of thousands of dunams of crops each year. No one told us about the legislation by means of which the state has stolen most of the Bedouin lands. It has never been explained to us how laws are implemented in a racist way to deny Bedouins the possibility of building their homes legally. In most cases when I come across reports in the Hebrew media about the state's war against the Bedouin, it seems that the Bedouin are the criminals who are causing damage to the state. Now, when the Israeli government, with the aid of the "Yoav Unit", has crossed a red line in its war against those stubborn Bedouin from the Abu-Amdiam family, who insist on living on their lands in the village of El-Araqib, and has invaded the cemetery complex of the village and destroyed all the buildings (except the mosque), we are told that this is simply the enforcement of the law. And in truth, those who are fighting against the Bedouin have also legislated land laws that allow them to rob Bedouin lands. They have also created legal ways of ignoring traditional Bedouin land ownership, even when the latter have documents proving their ownership. It may all be legal, but it's neither just nor ethical. The Nurnberg laws in Nazi Germany, the apartheid laws in South Africa, and the racial laws in the U.S. South were legal too. They all had one problem, they were immoral. - Amos Gvirtz is a veteran Israeli activist for peace and justice. I wrote this article when, in the first time, the Israeli government destroyed all the structures (except the mosque) in the cemetery of El Arakib. Please, write protest letters to the Israeli embassy in your countries. Thank you!